Why is Business Architecture relevant now? How do organizations use Business Architecture? Where does Business Architecture fit within an organization? What benefits does Business Architecture provide? How does Business Architecture relate to IT development? What is the difference between Business Architecture and business improvement disciplines? What does translating strategic direction into business design mean? How does Business Architecture bring agility to business and IT execution? How does Business Architecture increase operational efficiency and capacity for growth? Business Architecture shows how an organization is structured or how the elements of the organization such as capabilities, processes, organization and information fit together. The relationships among the elements dictate and specify what the organization does, and what it needs to do to meet its goals. Essentially Business Architecture is the blueprint of an organization. Business Architects help to create a company’s blueprint to better understand the goals of the organization and capture how different elements of the organization work to achieve those goals. An organization is an ever changing entity. By analyzing and interpreting the blueprints, Business Architects provide insight into what and how the elements need to change in order to achieve the new goals of the organization. These blueprints are key to translating the goals and strategy into actionable steps that can be implemented in an integrated, consistent way across the enterprise. Some people ask why Business Architecture is necessary now, especially after organizations have operated without it for so long. The pain of not having a Business Architecture is magnified by the pace of change in today’s world, as seen in organizations that morph over time into highly isolated silos, as a result of merger and acquisition, or through common lack of planning. The absence of a Business Architecture prevents organizations from being able to adapt quickly. Companies that are not agile in today’s fast-past, hyper-competitive marketplace cannot survive. Technology is rapidly evolving. Customers demand what they want, when they want it and where they want it. The business environment changes every day requiring organizations to react to security and privacy concerns, new regulatory and compliance measures, and new competitive threats from around the globe. Business Architecture has become an absolute necessity in order for an organization to identify the impact of change on the business and to respond quickly and effectively. 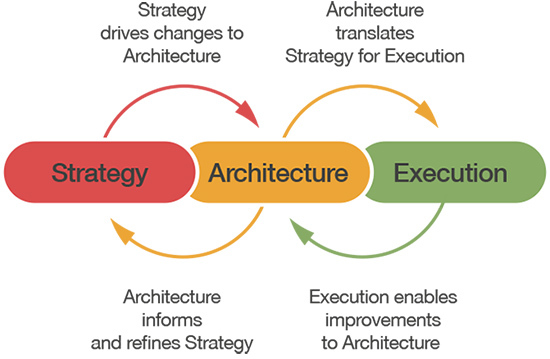 Architecture serves as the bridge between strategy and execution within an organization. Strategy and operational demands drive changes to Business Architecture and Business Architecture serves to translate these ideas into actionable steps that can be implemented in an integrated, consistent manner across the enterprise. As a result, Business Architecture typically has a direct tie into the enterprise strategy, planning and software development processes. Focused and aligned strategy. Business Architecture helps to translate strategy into action and focus investment. Improved decision-making ability. Business Architecture helps the business to understand the complete impacts of decisions before making them. Increased operational efficiency and capacity for growth. Business Architecture helps an organization to rethink how it structures and streamlines business operations for efficiency and scalability. Agility in business and IT execution. A repository of reusable architecture content and defined processes that translate strategies into execution greatly accelerate an organization’s ability to identify and implement the necessary changes. Business Architecture defines the business target state components (i.e. process, capability, organization, etc.) and their relationships. These entities, along with the corresponding IT Architectures (Application, Data and Technical Architecture), are inputs to the solution design process. Business Architecture’s distinct value is most powerful in business transformation versus business improvement initiatives. Transformational change reshapes the people, processes, capabilities, technology and culture of an organization by aligning with a new strategic direction. Business improvement optimizes the execution of existing processes, capabilities and their value delivery channels, as demonstrated in disciplines such as LEAN, Six Sigma, Business Process Management (BPM), etc. We work with leaders to help define or refine business direction and drive consensus and decisions. We help leaders to visualize their direction, which can be promoted within the organization to drive change. We then create a holistic set of business designs (i.e. target business architecture) for implementation of the business direction. By leveraging reusable assets created by Business Architecture, we enable an organization to quickly understand the impact of change, without another costly reinvestment in current-state analysis. In addition, we put the appropriate partnerships and repeatable processes in place—both upstream and downstream—to quickly move from strategic vision to execution. Business Architecture increases operational efficiency by holistically evaluating the origins and contributing factors of specific problems across the enterprise. The result identifies the full scope of the problem, along with the opportunities, implications and risks associated with its resolution.